Northern Tablelands MP Adam Marshall, left, with Armidale PCYC Manager Sam Davis and Senior Constable Penny Wain in front of the front façade which will receive a makeover thanks to some State Government funding. THE front of the Armidale PCYC will soon undergo a major facelift, thanks to a $30,194 grant from the NSW Government, announced today by Northern Tablelands MP Adam Marshall. The funding, from the 2018 NSW Community Building Partnership Fund, will be put to good use by the local PCYC to spruce up the front of the Rusden Street building to make it stand out and attract more locals. “This is the third consecutive year the Armidale PCYC has received funding to make improvements to their building – which is tremendous,” Mr Marshall said. 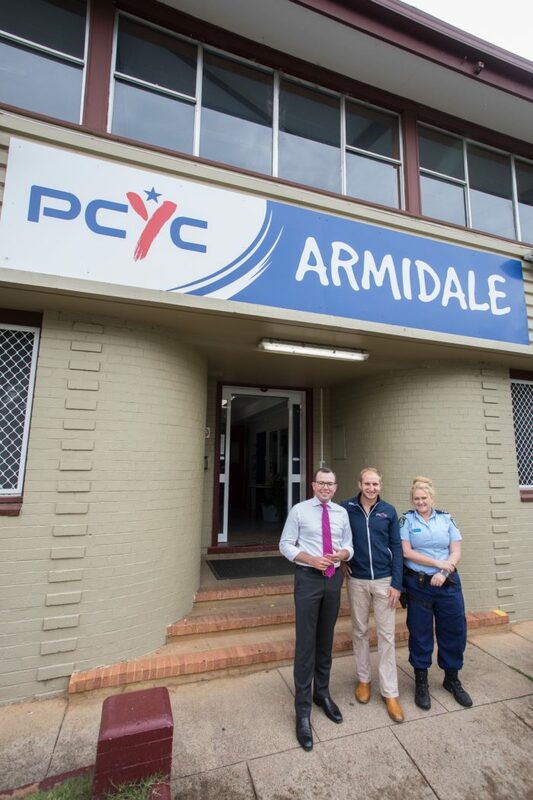 “The Armidale PCYC is very well utilised and has been steadily growing in popularity to become one of the busiest anywhere in the New England North West. “This funding will allow the committee to revamp the whole façade of the building. Armidale PCYC Manager Sam Davis welcomed the funding and said it would freshen up the tired looking structure. “We’re in a prime location here and we’ll finally have a building that is the billboard for the club,” Mr Davis said. “We hope that it will entice many more locals and visitors to come inside and see the huge range of activities we run here.